Bar’s Leaks spokesperson Bobby Janiec (right) visited the O’Reilly Auto Parts in Waterloo, Illinois, to present Mark S. with a check for winning the Bar’s Leaks $10,000 “Keep My Ride Alive” Sweepstakes. “How do you keep your ride alive?” Bar’s Leaks customers from all over America responded to that question on the brand’s website from May to December 2018 as part of the Bar’s Leaks “Keep My Ride Alive” $10,000 Sweepstakes. One of the more than 570,000 entries came from Mark S. of Waterloo, Illinois, who will begin the new year with a little extra money in his pocket after being selected as the contest winner. 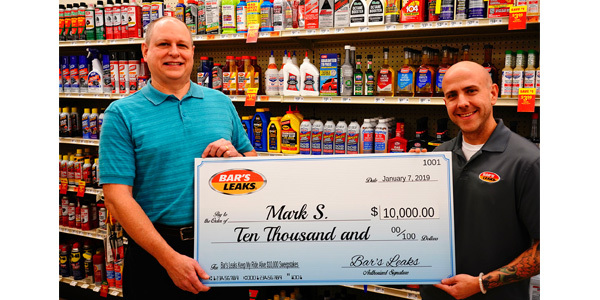 Bar’s Leaks recently presented the winner with a $10,000 check at the Waterloo O’Reilly Auto Parts store where he purchases his Bar’s Leaks products. Bar’s Leaks asked its customers to share their stories, photos and videos about the importance of keeping their ride alive. Mark S. is a long-time Bar’s Leaks and Rislone customer, having used both products in a number of vehicles through the years, including his 1983 Mercury Lynx and a Ford Ranger made in the 1980s. Holly, Michigan-based Bar’s Leaks has helped create “three-minute mechanics” out of each of its DIY customers, thanks to the brand’s variety of stop-leak products for engine and cooling systems, power steering, head gaskets, transmissions and more, the company noted. 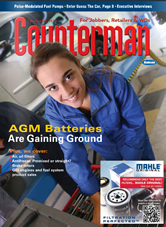 “These industry-proven, affordable treatments help customers avoid a costly and unnecessary trip to the mechanic or dealership and keeps their vehicles on the road and running smoothly,” Bar’s Leaks said in a news release.